When I saw Kate's dress last year it reminded me of the bodice style from the Princess Grace of Monaco dress. I think most people made that connection. I don't like Princess Grace's wedding dress. Speaking of another famous 50s-era wedding gown, I don't like Jacqueline Bouvier's wedding dress either. Speaking of another famous 50s-era wedding gown, I don't like Jacqueline Bouvier's wedding dress either. Same here tailleuse. That skirt is taking over the entire outfit. She hated it too. The dress was her mother's idea. Really? I didn't know that. Thanks. Yay! Sometimes I feel as if I'm a member of a tiny minority of women who don't like most of 1950s fashion. I'd agree with you all, I think the dress looks rather marmish and ot cool Britannia at all. To my eye the couple always dress like what they are two over-privileged professionals, like a sort of boring lawyer couple. Middleton would have set a far more forward tone by wearing her sister's dress in my opinion. I preferred Pippa's dress as well. I can understand why MIddleton would have made a conservative choice. There was a lot riding on it, even though the whole thing is silly. But I don't see why I have to say I liked it. 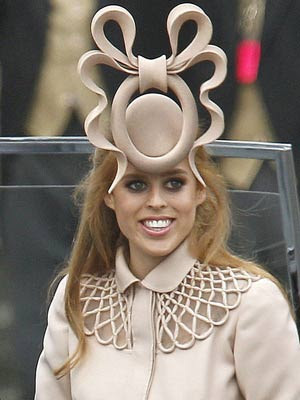 The weirdest misstep was those weird hats by Philip Treacy. I used to think he was brilliant. There was a gorgeous photo of Isabella Blow in one of his hats that used to get reprinted all the time. Those hats reminded me of the original costumes for an early Balanchine ballet that were hideous. I'd always be inclined to support Philip Treacy as a fellow Irishman as well as Galwayman, but there is little to recommend about that hat in my view. In general there is way too much matchey matchey in that outfit in terms of colour, a common flaw of a lot of outfits in my view. That being said you never know what he was asked to do, given that a lot of famous individuals rely on quirks or oddities to remain famous maybe its deliberate? Like going on celebrity big brother, although this is a far more upmarket version. In an interview he said something about wanting to create a unique experience. It was unique. You're right about not knowing what the client's preferences were, but It's hard to believe a 20-year-old woman would come up with an idea like that. As you said, the whole outfit is matchy matchy, and I don't like the detail on the yoke. Hi, concerning Kate's dress, i'm really interested about this technique. Is anyone familiar with this technique of "appliqué" over a tulle? First, I was wondering if this is a silk tulle and also what kind of hand stitch is suitable for this work...in my research they are talking about a "point de Paris". Is this hand stitch discrete enough for a thin flower stem? I did my own test with a simple backstitch, but i think that the problem the stitch has to cover the edge of the lace pattern in order to get a clean border...backstitching doesn't do the job correctly right? or maybe that depend of the kind of lace you use. I have a project to put some Chantilly lace on tulle and peau de soie and i'm a bit confused about what kind of hand stitch i can use...any idea? I've finally answered my question by myself. first of all the bodice is a silk net with appliquéd lace...so the first step was to find some silk tulle. but this give a nice idea of how to make an appliqué of chantilly on a silk net. So what you need is just some chantilly lace, a silk net and a lot of patience. Wow. It's uncanny. Although I suppose with Such a conservative fete as a royal wedding, one's options as far as style maybe quite limited or led in a particular direciton. I'm therefore only half surprised at the resemblance. Edited by DanMartin, 25 September 2013 - 02:25 AM. I don't think it was too much money at all for all of the work they did on it. I also loved the way it resembled Princes Grace's dress. I'm not a fan of the meringue either. And of course there's a whole historical and cultural history behind the garment. My own grandmothers for instance got married in what was called a travelling suit, a jacket and pencil skirt in the regular shades, spending that kind of effort on a garment that would only be worn once would have been an unimagineable expense at the time [1940s]. Which of course is why it was so favoured by the upper classes and then made its way down the social ladder. The waste is ridiculous, although as you said, it was a mark of class status. On Jackie's dress in particular, I hate those large rosettes, or whatever you'd call that embellishment. I really don't like most 50s styles. "The dress was very traditional with the huge bouffant skirt. This invited a remark that “the dress wore Jackie, not the other way round." The design was in deference to the wishes of the Kennedy family, even though the bride's own wish was for a simple dress with firm lines that would have complimented her tall slim figure. Despite the acclaim for the dress around the world, Jacqueline later admitted to friends that she didn't like her wedding dress, because it accentuated her flat chest. She was critical of the dress and also said that it looked "like a lampshade."" the wedding dress was nothing like anything jacqueline kennedy ever wore. i imagine it is impossible to know the entire story. A more streamlined, more minimalized dress does seem more like her style, doesn't it? Although as you say, we'll never know.